As early as the second century, before the Christian Era, iron plates or rings for shoes were nailed on horses’ feet in Western Asia and Eastern Europe. In Greece and Rome athletic contests, games of different kinds generally formed some part of religious observances and festivals. One of the four Grecian national festivals was the Olympian Games. These Grecian Games consisted of boxing, putting the weight, chariot races, archery, and discus throwing. The discus was similar in form to the modern quoit but not in size and weight. Originally, it was a circular plate of metal or stone 10- or 12-inches in diameter. It was pitched or thrown with a strap or thong passed through a circular hole in the center,the strap being released by the player as he swung it so the discus would go the greatest possible distance. There is a tradition that the camp followers of the Grecian armies, who could not afford the discus, took discarded horseshoes, set up a stake and began throwing horseshoes at it. Horseshoe historians have not been able to discover when the game of quoits or horseshoes was changed so that it was pitched at two stakes, but it is pretty well established that horseshoe pitching had its origin in the game of quoits and that quoits is a modification of the old Grecian game of discus throwing. Following the Revolutionary War, it was said by England’s Duke of Wellington that “the War was won by pitchers of horse hardware.” In 1869,England set up rules to govern the game. The distance between the stakes was 19 yards. The player stood level with the stake and delivered his quoi twith his first step. There was no weight requirement but the outside diameter could not be more than eight inches. The ground around the stake was clay and all measurements for points were taken between the nearest parts of both quoit and stake. These became the rules under which the game was played in the United States but no tournaments were held or records kept until1909. The game seemed to have been a favorite among soldiers in most wars. Returning home, these soldiers interested their home folks more than ever in the game and horseshoe pitching courts were laid out in hundreds of cities, villages, and farming communities. The impetus for the NHPA as we know it today grew out of the throwing of mule shoes in the Union Camps during the Civil War. Courts sprang up in the backyards of Union states.Rules differences arose regionally. The first horseshoe pitching tournament in which competition was open to the World was held in the summer of 1910 in Bronson, Kansas. The winner was Frank Jackson. He was awarded a World Championship belt with horseshoes attached to it. At this time, Jackson had never heard of being able to hold a shoe so it would open toward the stake, but he had been practicing to find some way by holding his shoe with his finger around the heel calk so he could pitch ringers. The games were played on dirt courts on stakes 2-inches high above the level ground with stakes 38 feet apart. Jackson had acquired the skill of pitching a ringer over the 2-inch stake and laying his second shoe on top of the stake time after time so his opponent couldn’t keep his ringer on. Each man drew a number in this tournament and Number 1 played Number 2, Number3 played Number 4, and so continued until every man had played. Then numbers were drawn again by the winners, and play continued in the same way until the last winner was declared the World Champion. Game points were 21, ringers counted five, leaners three, and close shoes one. There was no regulation shoe size or weight. In 1911, the height of the stake was raised to six inches with the same scoring system with closest shoe counting one regardless of the distance form the stake. The top ringer received the count of all ringers on the stake. Games were still 21 points. One pitcher had a shoe in which the curve on one side was four inches more than on the other side.At a Topeka Tournament, Jackson used a pair of shoes he had made by a blacksmith,who bent the calks so the shoe would slide better in the sand and help him slide ringers on the stake. The first ruling body of horseshoe pitching of which any record was found was organized in a court room of the First District Court, Kansas City, Kansas, May 16,1914. A Constitution, By-Laws,and Rules were adopted and officers elected. The name chosen was the Grand League of the American Horseshoe Pitchers Association. The association granted Charters to local leagues in many states and their rules were accepted as standard in governing all regular horseshoe pitching tournaments. They established the rule that like values always canceled like. They raised the stake to eight inches, which met with approval of most pitchers. They established the weight of shoes so that in the 1915 Annual Tournament, no shoes were used that weighed less than two pounds, or more than two pounds, two ounces. They kept the rule that leaners counted three points, ringers five points, and no shoe more than six inches from the stake would count. Pitcher’s box was three feet each side of the stake and six feet back. The pitcher could stand anywhere in the box. Stakes were 38-feetapart. The association published a book called the “Horseshoe Guide,”which contained playing rules, report of the Annual Convention, officers,the Annual Tournament, and other contests. On February 26, 1919, the National League of Horseshoe and Quoit Pitchers was organized at the National Tournament in St. Petersburg, Florida, with representatives from 29 different states attending. They were given a charter under the laws of the State of Ohio on June 17, 1921. In the 1919 Tournament, the distance from each stake was changed to 40 feet, distance that is in effect today. The 8-inch height of the stake at this time leaned one inch toward the other stake and the stake was 3/4 inches in diameter. Only 19 pitchers pitched in the Tournament.Games were 50 points. In 1920, the game rules were changed drastically.Stakes were raised to 10 inches, stakes were 1 inch in diameter, ringers counted three points, close shoes one point, and leaners were abolished. In 1923, the lean of the stake toward each other was changed to three inches.The 1920 Winter and 1923 Summer World Champion, George May from Akron,Ohio, has been recognized as the father of the “open” shoe. He won the title in 1923 with a 14-1 record and 60 ringer percentage. However,in the winter of 1909, a game was played in Florida in the sand where sometimes all four shoes would bury themselves so deep in the sand that they would all be covered out of sight. While digging out the shoes that had been pitched by Dr. F.N. Robinson from New York, and one of the pitchers who was digging out the shoes made a new discovery and said, “Doc, your shoes all come fork to.” This had never been previously noticed even by the doctor himself. The other pitchers then began to question the doctor to find out how he did it, but the doctor didn’t know, only that it became natural to him to release his shoe so that it fell open toward the peg with a one and a quarter turn. He had held the shoe with his first finger around the heel calk as all others did at the time. As far as is known,this was the beginning of trying to control the open shoe in pitching,now known by every good pitcher. It was not until the late 1930’s or early1940’s that the stake was raised to 12 inches, and in 1950, the stake was ruled to be between 14 and 15 inches high. The present day rule of 40 points for an official game was changed effective January 1,1982, the last major rule change governing play. 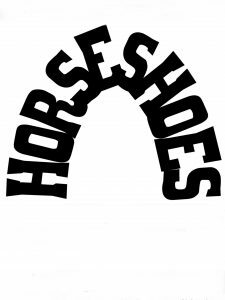 On May 10, 1921, the National Horseshoe Pitchers Association of the United States was also incorporated under the laws of the State of Ohio with headquarters at Akron, Ohio. A year or two later these two National Organizations were consolidated under the name of the latter. At the National Convention at Lake Worth, Florida, February 16,1925,the name was changed to the National Horseshoe Pitchers Association of America. It is estimated that upwards of fifteen million enthusiasts enjoy pitching horseshoes in the United States and Canada in tournaments, leagues,recreation areas, and backyards. The NHPA membership totals about 15,000 with 6,200 in the league program. This successful handicap league program allows beginners as well as seasoned players to pitch together. It is a good program for attracting new players to take their first step into organized horseshoe pitching. The NHPA strives to promote and organize the sport and to standardize the rules, equipment, and playing procedures. The top priority is to serve as a unifying agent between state associations, local clubs, unorganized groups, and individual players. Indoor courts are constantly becoming more popular. Year after year, more indoor courts are being builtin the non-sunbelt areas. These courts make horseshoe pitching a year-round sport. Besides World Tournament Awards, championship awards are given at all NHPA sanctioned tournaments, and numerous awards in many categories are given to the NHPA League program. Six classes are recognized as Championship.They are: men, women, boys, girls, senior men, and elders (70+ years old and pitch from 30 feet). Women and juniors also pitch from 30 feet. Senior women’s classes are held when enough entries are received to support the division.